We have a small problem with some entries that have a different pattern than the script that swuforce created for us. In principle, the structure is an xml where the second entry is extracted, these examples are the words "Vela" and "Pan"
The problem is that for the words "Puert" and "Huev" are placed in the fourth entry. These are the script created by swuforce . findloc offset string "\x00\x00\x00\x00\x02\x00\x00\x00x06" 0 ""
findloc offset2 string "\xff\xff\xff\xff\x06\x00\x00\x00" 0 ""
xmath dsize "asize - offset1"
xmath dsize "offset2 - offset1"
I have tried to modify the script many times and I can not make it work. Maybe another way to modify these two entries, is to directly access their position and edit them, but I've tried and I have not known how to create a valid script. It is possible that it works by accessing the string position directly, but we would not know how to do it either. Have you tried contacting swuforce? I don't know if he will see this topic. Yes of course, I tried to contact swuforce, but I have not gotten any response, it has been a while since he published anything in the forum, I think he will be very busy now. It's a shame that having the translation almost finished, and not being able to solve that "little" problem, that's why I ask for help in the forum. Aluigi, Can you modify the script to edit those entries? Please aluigi or swuforce or whoever. We have almost finished translation of that game and that's the only missing detail. ¿Can you help us? Trust me if I tell you that I have absolutely no idea of what you need or where is the problem or what is this format and what these scripts are meant for. export generates a txt file with NUL delimited strings from the VBI input. import... no idea what it should do. No idea where you got that xml file and there is no "Puert" word in the txt. Sorry, but I can't help. I support only the scripts written by me. If there is a topic open by swuforce about this game and scripts, please post there or link it here and I will move these posts there. Hello, thanks for your answer and your work. We are using your script to fill the lines wich swuforce's script doesn't found. The issue is when I add or remove a character in the .dat file generated by your script, the game stops working, that's why we have to write "Puert" or "Huev" instead "Puerta" or "Huevo". I only can replace that line with a line that has 4 letters, not less or more, if I want the game to still work. I can use empty spaces for fill the remaining characters when the new string is smaller than the original, but when is bigger I have to cut it out. Now the problem is clear but I can't help you and swuforce can't too. The script made by swuforce is called "importer", it's NOT a rebuilder, therefore everything is limited by the original size of the strings. Problem is that for some unknown reason script does not export "Egg" and "Door" (repeated and located in different addresses from .DAT file) to the txt file that is created. If it could we would be able to translate them and reimport them without any limitation or hexadecimal edition same way as we do with the other strings of the game. We just need some exporting/importing scripts for those two strings. There is no original size limitation in swuforce script because we are able to translate and import translated txt file without any kind of problem. Don't know how swuforce's script works, but for example the sixth line of .txt generated by his script is "Behind Toni's House" (19 characters) and in our replaced txt is "Parte trasera de casa de Toni" (29 characters). I can confirm that right now the game is fully working with that and all replaces. Maybe his script removes characters from other strings to compensate the added characters? I tried to do that with your .vbi script, removing one character from the previous string to add to the next string ("Egg" + "Huev" to "Eg" + "Huevo") but the game stop working. In any case thanks for your time. Sorry it's my fault, I have not explained the problem well. 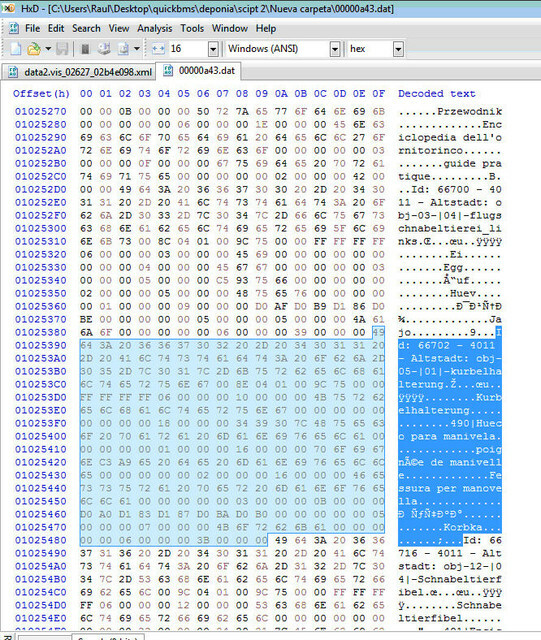 and swuforce using the encoding of aluigi made a script to modify the game,. The swuforce script converts the file with extension * .vbi to * .dat, the file * .dat is the xml and extracts the entries that need to be translated into an easily editable txt file, and then with another script, the file is imported txt again. The problem is that some entries the input that needs to be translated does not occupy the second position, occupies the fourth position, in this for example the swuforce script extracts the second entry "Egg" but we need to extract the fourth entry "Huev"
T27 = "3" --- Italian. The idea would be to modify the script so that it could show all the entries T27 = "1", if this is not possible, try to extract the entries of the fourth position. Unfortunately we do not know how to do it. I hope that now the situation is understood, I am sorry, but it is not easy to explain it.